ST. PAUL, Minn. - Led by a group of teenagers, Minnesota lawmakers are set to introduce a Green New Deal-style bill, inspired by the federal resolution of the same name unveiled in February. Under the bill, Minnesota utilities would be required to provide 100% carbon-free power to customers in the next decade. Minnesota's lawmakers enlisted young people to help craft the bill, including Mia DiLorenzo, a freshman at Edina High School. DiLorenzo is part of the group Minnesota Can't Wait and believes climate change is the single greatest threat to her generation. "I know that we kind of all get caught up in the drama of national politics, but we kind of forget that a lot of the change happens on the local and state level, so if we start pushing for large change within our own communities, that can all add up to a greater movement," says DiLorenzo. Despite its reputation for bitterly cold winters, a report in January showed Minnesota is one of the fastest warming states in the country due to climate change. Scientists say Minnesota's winters are warming at a rate 13 times faster than its summers. 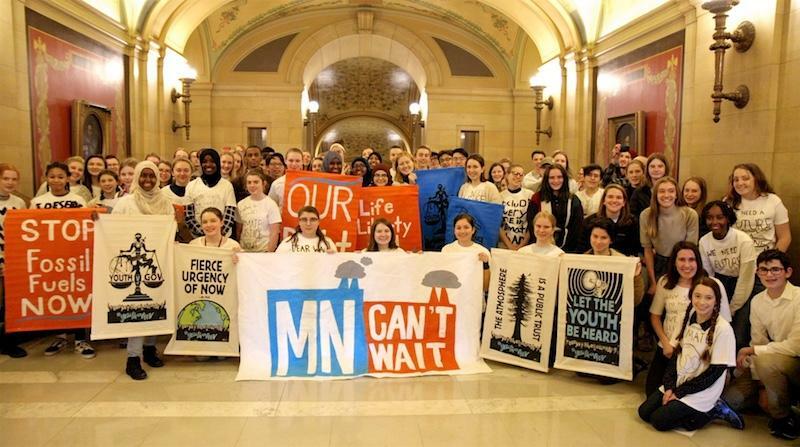 Minnesota's Green New Deal legislation to address climate change is being touted as the first youth-led effort of its kind on a state level. Tiger Worku is a senior at South High School in Minneapolis, and says the legislation should be taken seriously as a starting point because it's the only proposal on the table. "The price of inaction is going to be way more than the price to take action," says Worku. "That's why I don't think that people saying it's too radical or too visionary have any real basis." The bill would require Minnesota to report on strategies to mitigate greenhouse-gas emissions associated with sectors such as agriculture and transportation. The legislation is sponsored by a pair of Minneapolis Democrats, state Representative Frank Hornstein and Senator Scott Dibble. In spite of the snow, students from across the state gathered at UW Stevens Point’s Treehaven on Wednesday. The Youth Summit featured environmental project presentations and activities. High school and middle schoolers gave presentations on topics ranging from threats to coral reefs to recycling and how to raise crickets. One student presented on how to make biodiesel as an alternative fuel.